Located close to Montrouge, the Novotel Paris 14 Porte d'Orléans hotel offers easy access to the heart of Paris! With its renovated rooms, fitness center and restaurant, you will be close to Montparnasse train station and the exhibition center. 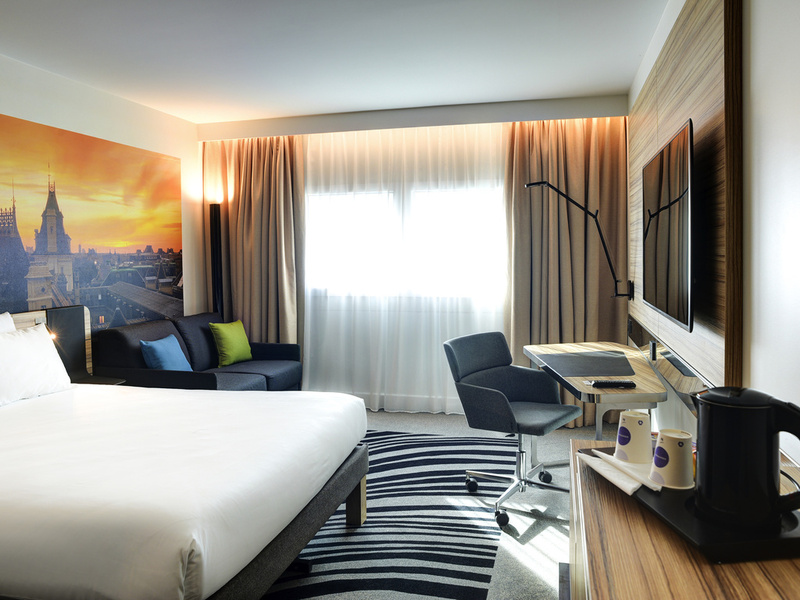 Entirely renovated in 2017, Novotel Paris 14 invites you to take in views of the capital from its suites and Executive rooms. Total soundproofing and top-of-the-line bedding guarantee a sound night's sleep. In each room is a panoramic photograph of Paris' rooftops. With four meeting rooms, a mezzanine work space, lounge bar, restaurant and fitness room, this Paris hotel is designed for business as well as relaxation. Offering covered parking and direct access to the ring road, this hotel in Paris is ideal for those travelling by car and planning to visit the Château de Versailles. Our location is equally convenient for those on foot, as the T3 tram stops at the Porte de Versailles exhibition centre. Line 4 of the metro allows you to easily reach the Eiffel Tower, the Champs-Elysées and Notre-Dame Cathedral. Other methods of public transport give you quick access to Orly Airport and the Montparnasse railway station. Whether you're staying for several days or taking a break for a few hours, the major sites in the capital of romance, fashion, gastronomy, culture and business are just a few stops away via metro line 4 from Porte d'Orléans station located near the hotel. Make yourself at home in a spacious, soundproof Novotel room, renovated in a modern style in 2017 and ideal for all your needs. Our 150 rooms come with free WiFi, AC, flat-screen TV & a minibar With free bottle of water. Choose an Executive Room or Suite and enjoy a space of 388 sq. ft. (36 m²) to 484 sq. ft. (45 m²) with lounge area, ideal for families. With plenty of VIP perks: Bathrobes, slippers, free mini bar and Nespresso coffee machine. In need of a tasty snack? Our chef whips up fresh, seasonal dishes at the fully renovated Novotel Café. You can also treat yourself to our selection of wines, or order from the menu in the bar or your room at any time. Whether attending a business meeting or enjoying a drink among friends, we have created the perfect place to share a pleasant moment at the Novotel Paris 14 Porte d'Orléans. Why not take a few moments to unwind in our cozy, inviting and stylish space. there was a door to next room through which you could hear too much what happened in the next room. unexeptable. toilet and sink in different rooms, not convinient. Rubbish of previous guest under the bed. No vegetables of any kind at the breakfast. Everything was perfect. The room was spacious for our family (2 adults and 2 kids) and very clean. The staff very friendly and willing to give us any information that we asked. At the end the breakfast had everything that you want to have a good breakfast to start your day!! We had a delightful stay. We arrived early and we were given early entry to a room. We were delighted to find breakfast included as well. The room was nice. The first day we were told that breakfast was served until 10 am so we went upstairs and they told us it was only until 9:30 and for us to go to the bar downstairs and our complimentary breakfast could be there. We were then charged. We really didn't need a full breakfast just wanted to grab a banana but they selected the breakfast that came. It was fine but I was trying to tell the lady out checkout what had happened and she was very rude to me and told me to leave and would not give me a receipt for my stay. I asked again for a receipt but she said it would be emailed. I have never yet received my receipt and I need it for my university. I will call to get a recript however its unacceptable to not get a receipt for our stay. Good customer service from front desk. Restaurant service was slow. Sometimes the front desk could be more helpful. Everything was as expected and up to standards. Staff was courteous and pleasant. Room was adequate. Elevators are incredibly frustrating and make everybody angry. whole in the bed sheets. Not very friendly staff. Gloomy atmosphere. For the last 8 (eight) years we have stayed at your hotel on our way back from our annual ski ing trip. We travel with our two medium sized dogs. This year however we went to eat in the restaurant on the evening of Friday 4th January 2019, arriving at the restaurant we were told that we were not allowed to take the dogs in. Never before has this happened, your staff member Nicholas was quite rude to us, calling Mr G. a liar. We were also travelling with friends for the first time, they have two smaller dogs and were advised they could eat in the restaurant. Fortunately another member of staff came to our rescue and set us up a table in the bar, which was very good of him but not the experience we were after. The next morning we all came down for breakfast with the dogs and were seated without question. Firstly, why advertise yourself as a dog friendly hotel but then sometimes not allow them in the restaurant. Secondly, You charge for the dogs, what are you charging for? Thirdly, The staff member at the restaurant said dogs were never allowed in the restaurant and he has been there for 15 years yet this was our 8th consecutive stay and never before have we had a problem Fourthly, Please would you confirm whether dogs will be accepted in the restaurant without problem in the future otherwise we will have to find an alternative hotel which would be a shame Ashley & Karen G.
I liked the hotel location, the modern look and feel of the room, compact but feels spacious, and it had plenty of USB charging ports. Room service was pretty quick. However, the menu does not have much variety for vegetarians. I could basically only have the falafel bowl or avocado toast. It would be nice to have a bit more variety of healthy meals, such as a big salad (without meat and cheese). Also, the gym hours are a bit limiting - I am used to going to the gym before work around 5:30-6am. Pros: I chose this hotel mainly because of it's location since we were driving (and to avoid driving into central Paris). The room was amazing with a nice view (we booked a suite). Bed was extremely comfy, temperature was perfect and bathroom so spacious. I managed to sleep the whole night through. Cons: Entrance to car park is so so small. I had difficulties accessing the car park with a small SUV. Breakfast staff could smile once in a while. Breakfast itself could be a bit more varied. Upon check out, the receptionist did not ask how I would like to pay but just debited my card. I would have expected that I am consulted before hand. Ahmed and Catherine were very helpful to us. They quickly fixed an issue with our booking. As I stated in title, location was OK but you need to improve your breakfast. I recommend you to visit Van Der Valk Hotel in Mons to find out the missing points in your service. They offer an intercontinental breakfast for 15 Euro with very delicious and several types of dishes.